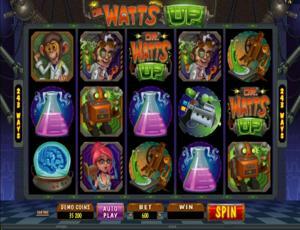 Dr. Watts Up is an online video slot machine game released in June 2013. It is offered exclusively at online casinos powered by Microgaming. This online video slot game has 5 reels and you have 243 bet ways to win per spin! The theme of Dr. Watts Up is based upon a wacky doctor who comes up with weird experiments in his laboratory. Did you have the chance to own a chemistry kit or a science kit when you were a child? If yes, and you remember that you enjoyed your “scientific” game, then you will surely love to play the Dr. Watts Up online video slot game from Microgaming, where you can win up to 480,000 coins! A quirky soundtrack and amazingly crafted symbols that follow the comical mad scientist theme will surely keep you entertained as you spin the reels and hope to get zapped by the excess voltage of cash prizes in Dr. Watts Up’s secret laboratory! Microgaming online slot games are available to players in 2 formats – download and no-download. Whether you like to download their software first or you prefer to play instantly without the need to download, then Microgaming surely has online slot machine games to accommodate your every slot gaming preference. Good thing that Dr. Watts Up is available for instant play, so you do not have to download anything to find out if this game interests you in a way that you would like to spend some real money on it. Dr. Watts Up is created for those who find Cartoon Network’s Dexter’s Laboratory an amusing cartoon show, and also, this game is for those who had a fun time experimenting on science kits or chemistry kits when they were little children. The Dr. Watts Up online slot game features 243 permanently-enabled ways to win, scatter wins, a wild symbol, a Free Spin Bonus Feature game, a Laboratory Bonus Feature game, a Skill Stop Feature wherein you can stop the reels from spinning even before they stop on their own, a maximum coin jackpot of 50,000, and a maximum cash jackpot of $10,000! The quality of the graphics and sound that Microgaming provides is absolutely fantastic and top notch. They have an impeccable reputation of making the most stunning graphics and true-to-life sound effects that will truly transport you to “that specific theme” they used in any of their slot games. Most people love to play games incorporated with Microgaming software because they have smooth animation and engaging yet non-interfering sounds. In Dr. Watts Up, players are brought inside the secret laboratory of Dr. Watts Up, a mad scientist who conducts weird experiments with cute animal subjects, build robots, and concoct extraordinary potions! The symbols are drawn in a cartoonish fashion, and even if they are vibrantly colored, you will play here for a long time because it will not hurt or strain your eyes. Excellent animated programming is used on the symbols when you successfully hit winning combinations. The overall graphic design of Dr. Watts Up displays the checkered floor of the lab at the bottom of the reels, and you will see electrode guns attached to both top sides of the reels. The constant background music you will hear in this game is highly similar to comical mad scientist-themed TV cartoon shows. Various music and sound effects are programmed when you form winning combinations with specific symbols. For instance, when you form a winning combination with the Chimp symbol, you will hear the distinct Chimp sounds that it makes. When you form a winning combination with the redhead lab assistant, you will hear her say “Wooh!” as she tries to maintain her composure from the explosion behind her. A menacing guffaw will be heard when winning combinations are formed with the Dr. Watts Up wild symbol. There are no card deck symbols available in the Dr. Watts Up online video slot game. The regular symbols that you will find in Dr. Watts Up are the Flask, Brain, Snail, Ray Gun, Robot, Chimp, Lab Assistant, and Dr. Watts Up. The Wild Symbol is the Dr. Watts Up Logo. The Dr. Watts Up Logo wild symbol acts as a substitute for all other symbols (except for the Scatter symbol) in order to you help you form winning combinations. There are 2 Scatter symbols in the Dr. Watts Up online slots game: the Atom, and the Lab Rat. The scatter symbol is not required to appear in a line (on an enabled pay line) for you to win. • Atom scatter symbol – appears anywhere on the 5 reels, and you are able to form winning combinations as long as there are 3 or more Atom scatter symbols that appear. Your winnings are calculated by multiplying the Atom scatter symbol combination payout (refer to the Payout table) by the total number of coins you’ve bet. If you manage to get 3 or more Atom scatter symbols, you will trigger the Free Spin Bonus Feature game. • Lab Rat scatter symbol – appears only on the 1st, 3rd and 5th reels. If you manage to hit 3 Lab Rat scatter symbols in any position on the 1st, 3rd and 5th reels in a single spin, you will trigger the Laboratory Bonus Feature game. Please take note that if you get a scatter win and a regular win, then you are paid out for both of these wins, because the scatter symbols are not required to come out on an enabled pay line for you to win. Scatter awards are independent from pay line awards, and thus they are added to the pay line win. • Free Spin Bonus Feature Game – If you manage to get 3 or more Atom scatter symbols, you will trigger the Free Spin Bonus Feature game. If you manage to get 3, 4 or 5 Atom scatter symbols, you will begin playing the Free Spin Bonus Feature game with 10, 15, or 20 Free Spins respectively, and on each Free Spin, a random reel is turned Wild! Your wins are multiplied by the total bet staked. Your wins are added to way wins. The Free Spins cannot be re-triggered. The Laboratory Bonus Feature game and the Free Spin Bonus Feature game cannot be triggered simultaneously. However, the Laboratory Bonus Feature game can be triggered during the Free Spins. All bets are the same as the game that triggered the Free Spins. Up to 480,000 coins can be won in the Free Spin Bonus Feature game! Once the Free Spin Bonus Feature game is over, you will be then taken back to the main Dr. Watts Up online slot game, and your winnings from the Free Spin games will be included to your overall balance. • Laboratory Bonus Feature Game – If you manage to hit 3 Lab Rat scatter symbols in any position on the 1st, 3rd and 5th reels in a single spin, you will trigger the Laboratory Bonus Feature game. In the Laboratory Bonus Feature game, you will be asked to concoct a new serum by picking out 2 chemical tubes and these are fed into the chamber, changing the lab rat into something different such as a flying mouse, a three-headed mouse, or a cat (you are given a random prize depending on the outcome). You have 2 chances to change your mind. Click Yes to keep the result and end the bonus game, or Click No to make a new selection. The Laboratory Bonus Feature game and the Free Spin Bonus Feature game cannot be triggered simultaneously. However, the Laboratory Bonus Feature game can be triggered during the Free Spins. All bets are the same as the game that triggered the Free Spins. Once the Laboratory Bonus Feature game is over, you will be then taken back to the main Dr. Watts Up online slot game, and your winnings from the bonus game will be included to your overall balance. Dr. Watts Up has 5 reels where you have 243 permanently-enabled bet ways to win per spin! The minimum bet is 0.01 and the maximum bet is 0.20. You can wager from 1 up to 20 coins per line. Thus, the minimum bet amount is 0.30 and the maximum bet amount is 120.00 per spin. The maximum payout you can get in the standard Dr. Watts Up online slot game is 2,500 coins per line bet. Players who regularly play online casino games apparently like to stay much longer on online slot games that have an Autoplay function. It’s absolutely fantastic that Dr. Watts Up comes with a helpful Autoplay function! You can have the game spin automatically for you with the Autoplay function that can be found by clicking the Autoplay button (located on the left corner below the reels). • Until Stop: The reels will continue to spin until you have clicked on the Stop button. Spin Settings – number of spins to play (choose from 5, 10, 15, 25, 100, 250, 500). Spin Stop Settings – you can choose to Stop: when all spins are complete, or if win exceeds or equals to an amount you specify. After customizing the Autoplay function to your preferences, just click on the Start button, and the game will automatically spin for you while you just sit back, relax, and enjoy playing this wacky doctor/mad scientist-themed video slot game!